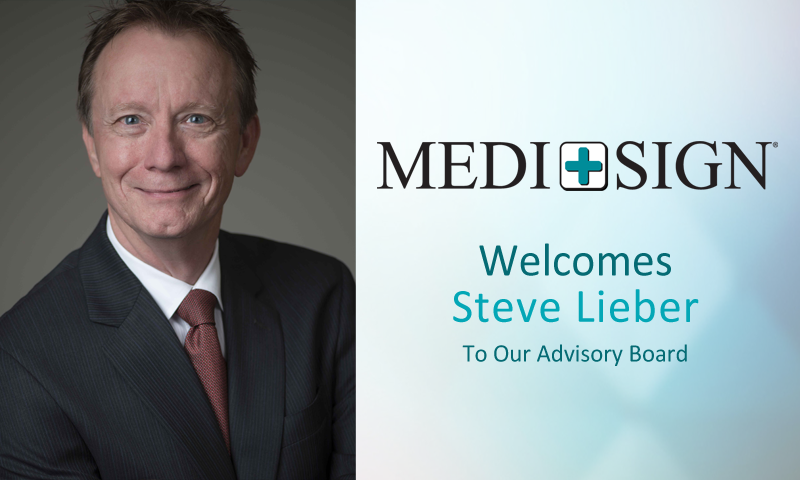 January 8, 2018 – Smithsburg, Maryland — MEDI+SIGN, a healthcare technology company that provides automated communication to the patient’s bedside, would like to officially welcome Mr. H. Stephen Lieber, CAE to the MEDI+SIGN Advisory Board. “We are truly thrilled to have Steve on our team. Steve is an industry expert, bringing over 35 years of experience in healthcare, strategic leadership and advisory roles. We look forward to working alongside Steve as we shape the future of healthcare and patient experience,” says David Linetsky, CEO and Founder of MEDI+SIGN. Steve Lieber has recently retired as President and CEO of HIMSS (the Healthcare Information and Management Systems Society), a global, cause-based, not-for-profit organization focused on better health through information technology (IT), serving 17+ years (2000-2017). Previous positions included serving as the Executive Director of the Emergency Nurses Association (ENA) for nearly nine years before accepting a position with the American Hospital Association as Vice President, Division of Personal Membership Groups. Prior to that, Mr. Lieber worked at the Illinois Hospital Association as Vice President of Operations. As a nationally recognized commentator on health policy, in general, and specifically on healthcare IT trends and issues, Mr. Lieber is a regular speaker and contributor to corporate strategic planning efforts, government-sponsored policy efforts, private sector initiatives and other non-profit organizations. MEDI+SIGN provides hospitals and healthcare organizations with a connected health data integration and visualization platform that includes digital whiteboard display solutions. MEDI+SIGN integrates data from electronic health records, remote monitoring systems and IoT devices to communicate key patient health and status information to care teams and patients. MEDI+SIGN was established to leverage its proprietary, data-driven visual communication technology to improve hospital and healthcare provider’s performance in patient safety and satisfaction, as well as the overall quality and delivery of healthcare. MEDI+SIGN removes the burden of triple documentation from the nursing staff resulting in increased staff productivity and satisfaction. For more information, please contact us at www.medisigndisplays.com.